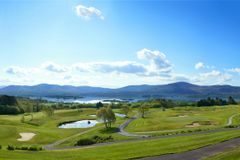 Overlooking Kenmare Bay, Ring of Kerry is the newest addition to the string of impressive golf courses in the Killarney area. It is also one of the most picturesque around, affording amazing views of the surrounding area, including Kenmare Bay and the overlooking Kerry mountains. The golf course is very good, and complements well the raft of championship links courses in the area, but it is accentuated by the truly awe-inspiring landscape. Ring of Kerry is a must for any golfing visitor to Killarney and the south-west. The design mandate was to create a world-class golf course, but it also follows the modern architectural principles of resort golf; from the back tees, even the best players around will face a stern test, but golfing enthusiasts are welcome, and accommodated sympathetically with a wide range of tees to suit all abilities. Capable of hosting both national and international tournament golf, the golfers must negotiate testing water hazards and sprawling bunkers.